Werner Herzog is, hands down, the most exciting director working in cinema today. Exciting because he makes connections between emotions, sounds and images that no-one else would begin to think of, let alone have the audacity to put on screen. His films vary from horror to documentary to cop thrillers - that is they vary by genre. But his films are always, everywhere, Herzog - obsessed with the power and cruelty of nature, human nature foremost - and wonderfully obsessed with the power of storytelling - filmed in a kind of gonzo style and yet with perfect control over the medium. For Herzog, mere truth should never be allowed to get in the way of a good story - from a deeper more profound truth. And neither should stand in the way of a lingering shot of a lizard! Herzog's latest film is a documentary that uses small 3D HD cameras to take us inside a famous cave at Chauvet-Pont-d'Arc in Ardeche. This cave contains the oldest known cave paintings, beautifully preserved by a delicate ecosystem - so delicate that ordinary tourists are rarely allowed inside. As a result, Herzog's film is the only chance most of us will get to see these beautifully detailed, vivid images. On one level, the documentary is conventional enough. Herzog shows us the paintings and interviews various members of the scientific team, who explain their significance. But nothing is ever that straightforward with Herzog. For he brings with him his childlike wonder at the beauty of the paintings - at early man's use of the curve of the stone and visual techniques to portray motion - and at the very idea that he is sharing a space across time with his earliest ancestors. 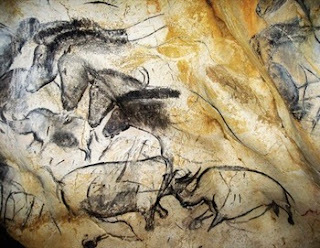 Who else would see cave paintings and describe them as a sort of proto-cinema, or make a connection between monochrome paintings and Fred Astaire? Some of this might sound hokey, but the sonorous particularity of Herzog's voice and the earnestness with which he delivers these ideas is as compelling as the paintings themselves. For let us be clear - while this is a documentary - it has the same strange stillness, macabre other-worldliness - as his recent film MY SON MY SON WHAT HAVE YE DONE?, complete with DP Peter Zeitlinger's tableaux vivants. And even more audacious, the final five minutes are a flight of fantasy, except that the content - too deliciously bizarre to spoil here - really exists! What can one say but that the Chauvet caves could have been photographed by many directors, and they would have looked wonderful. But only Herzog makes them seem vivid, connected to us, and magical. CAVE OF FORGOTTEN DREAMS 3D played Toronto 2010 and Berlin 2011. It was released in the UK in March 2011 and will be released in Germany in November. The film is being released in 2D and 3D. to my mind the 3D is more engrossing but the dimness of the image, in an already dim-lit cave, is a deep disadvantage.